The perfect filler for picture frames as well as for sealing cracks and crevices in wood furniture. 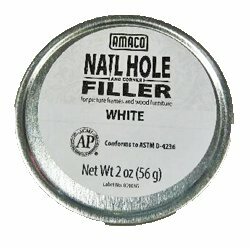 Nail Hole and Corner Filler is AP Non Toxic. A pliable filler for cracks, crevices and nail holes. Especially useful for picture framing, but also works great on wood furniture. Will not dry out or shrink. Perfect filler for picture frames as well as for sealing cracks and crevices in wood furniture. Will not dry out or shrink. If you have any questions about this product by Amaco, contact us by completing and submitting the form below. If you are looking for a specif part number, please include it with your message.